Classified » Home & Garden » Home Improvement » Vinyl Flooring is the most beautiful flooring for any style & any budget. Vinyl Flooring is the most beautiful flooring for any style & any budget. First, you do not have to stress about the quality of vinyl floor because customers are recommending this flooring. -This flooring is the perfect choice for your home. Get it today & save more with our running promos. 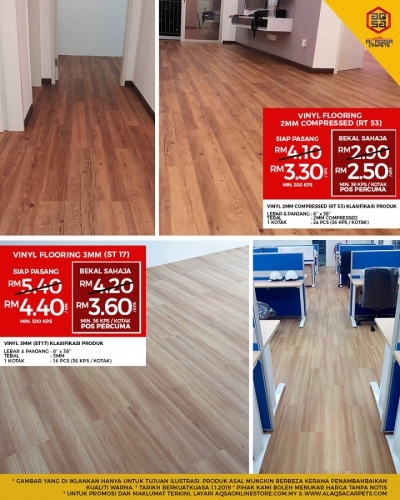 Starting from RM2.50/sqft for 2MM vinyl flooring. come & see our quality of products and compare our price Today!! Don't be late to call us. Limited Stock only! !